Recommended PSU (Power Supply Unit) is 36 Volts when using with high inducatance steppers but can be used with 48V PSU if using our Nema 23 low inductance steppers. 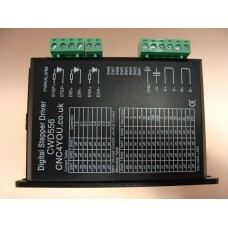 It is important you match drive current to stepper as over driving can damage the stepper and driver as high inductance steppes generate high backemf, also most impotantly never disconnect or plug in stepper stepper while live as this can blow the output Mosfets as generated ark can reach 1000’s of Volts. The CWD556 is a new generation digital 2 phase stepper motor driver, based on a 32-bit DSP processor, combination of the anti-resonance, low noise, micro-step and low temperature rise technology significantly improve the performance of the stepper motor, has low noise, small vibration, low temperature rise and high-speed torque. The driver use online adaptive PID (Proportional Integral Derivative) technology, without manual adjustment can be automatically generated optimal parameters for different motors, and achieve the best performance. Supply voltage range from 24VDC to 50VDC recommended 36VDC, are suitable for driving various 2-phase hybrid stepping motors which phase current below 5.6A. The microsteps can be set from 51200steps/rev and full step to the output current can be set form 2.1A to 5.6A with automatic idle-current reduction, self-test, overvoltage, under-voltage and over-current protection. Nema 23 3.1Nm High torque Stepper Motor 1.8 Deg, Dual shaft Colour change specification as before. ..
4 x Nema 23 3.1Nm High torque Stepper Motor 1.8 Deg, Dual shaft Colour change specification as .. Very High performance Nema23 4Nm Stepper Motor Checkout Video below to see capability of high q..
Our CP0-10V breakout board is a 4 Axis system board with built in Charge Pump circuit and 0-10Vo..